Great commentary on this book. It is one pf my favorites. I am also on a science fiction kick and I am rereading a couple of science fiction books right now. They are not positive books however. If you want something positive you may want to try Arthur C. Clarke (Mot Childhood's End, that in some ways is not positive) in particular Rendezvous with Rama or the Space Odyssey books. I have also been thinking of John Varley's Gaea Trilogy. I think that the three books, Titan, Wizard and Demon are excellent, intelligent and generally positive. I hadn't heard of this one before. So glad you heard of it, read it, and enjoyed it so much. It does sound like a fascinating read! Thanks for sharing! This came up in discussion at a book club meeting and I did feel ignorant for not knowing about it! So I rectified that and glad I did. It's very inventive in its concepts and I do find it fascinating that sci-fi of that era really did rely on concepts, there not being the flashy "effects" we are so used to in the modern day. Brian, thank you so much for the recommendations. Looking them up now! Yessss! Another top-notch review of one of my favorite books and writers. PKD is a mad genius and even though he has written several duds, "Do Androids Dream of Electric Sheep?" stands as one of his most accomplished works. It is thematically rich and seems even more relevant today with so much technological advancements. I still think you should watch 'Blade Runner' though since it is an excellent film on its own right despite its deviation from the original source material. I am not too keen on the sequel but I just might end up watching it out of sheer curiosity. I like that you mentioned that what he "lacks in poetry of language, he makes up for it in linguistic inventiveness." While I don't necessarily agree that this is true of all his writing, he does tend to be a writer of ideas. That is not to say that he incapable of writing a compelling narrative but more often than not, his ideas/concepts take precedence. Also, I have reviewed a bunch of books by PKD if you are interested. Since you enjoyed this one so much, I would highly recommend that you read "A Scanner Darkly" next. 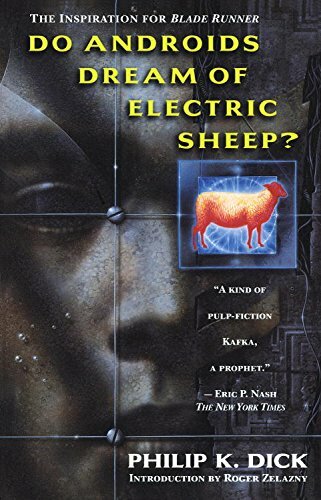 Unfortunately, it does not have the optimistic view of the future that you are looking for but it is, in my humble opinion, one of the greatest SF novels ever written. I will have to get back to you on Sci-fi recommendations that are more hopeful and not so bleak, haha.